Strange Fruit Project offer help without condescension; it's just the kind of healing we can all use. 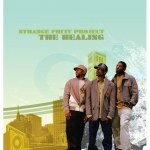 Both the band name Strange Fruit Project and the album name The Healing suggest something out of the ordinary. The group delivers, not just by avoiding the typical content of mainstream rap from Texas (their home state), but also by avoiding falling into strictly conscious themes. The trio also trades earthly concerns with spirtual ones without becoming either preachy or ungrounded. The Healing turns out to be the type of thing its name suggests, for people stuck in real-life situations but unwilling to keep their focus on the ground. Functioning essentially as a concept album, the disc starts off with a woman crying. It's sounds more gimmicky than it is, and it effectively sets the context for the album. The group doesn't swoop in like knights on white horses (despite their confidence), but they acknowledge the stickiness of the world, and the problems we all face. From that position they offer positive options to rise up, often starting with the role of God, but sometimes dependent on the ability of music to offer, if not salvation, at least hope. This role of music comes from the importance of community. At the end of "Ready Forum", we get a spoken meditation on the inability of a person to heal himself. Strange Fruit Project spin around this idea throughout, offering help, empathy, and uplifting beats. "Soul Clap" puts the idea into practice, offering the titular gift to "brothers on lockdown," those "on the bottom," and anyone trying to make it. MCs Myone and Myth attempt to rage through the world, but have to admit that they're "living just enough to get by". By taking that stance, they come across as peers trying to climb up together rather than privileged speakers lending condescending help. "Soul Clap" features some of the album's simplest and most effective beats, in this case by Jake One, but most of the album has a smoother, R&B-influenced sound. Group member S1 handles most of the production work, and while he's taken note from older, jazz-influenced groups, he marks out a unique territory with his soul beats. Given that his MCs would rather bang than wilt, he gives them hard enough tracks to keep the disc exciting. "Good Times" offers especially good production, with its simple percussion and steady chord changes, allowing the vocalists to easily flow between their challenges and the freedom available to us when we let loose. That sort of freedom, though, ultimately doesn't come from having a drink and forgetting your worries. As much as Strange Fruit Project avoids direct preaching, they never hesitate to point to God as the author of their freedom and healing ("He removes the shackles"). In "Liberation" they develop this theme: "So what's the definition of freedom? / Gold chains and fast cars / when God calls, we can't even keep 'em." This knowledge allows for an immediate escape from many of our worldly concerns; if it's not a healing yet, it's at least a lessening, and Christ knows that can be a start. Developing that as shared knowledge opens the door for the group work of "Soul Clap", which opens with "I could care less about what you brothers be driving." The hopeful, spiritual approach becomes a wholly-encompassing approach not only to pain, but to living in general. The resulting confidence of this burden-lightening comes across in penultimate track "Parachutes", with its message that no matter what happens, we can end up okay. The chorus, song by Thesis: "Feels good to know that / Though you're falling down / You're going to land on your feet". It's not brilliant psychology or theology, but its insistence and confidence uplifts even as it reminds us that some of life's key truths are basic. The final track eases out with the nonspecific "God Is". Strange Fruit Project has an unusual swagger, and it climaxes here with a slow faith and steady foundation. They also know how bad it gets, and they want to offer sounds and words to give just a little healing. Somehow they manage to be beneficial without exposing any nobility, which is the kind of help we can all use.